There is some degree of occupational stress, which is common to every organization at various levels of hierarchy. The police organization is no exception to the rule. Rather Policing is widely recognized as more stressful than any other occupation. Considering the difficult nature of police work and the stress it places on individuals. There is strong need to understanding the stress faced by policemen and their way of coping with these. They face strong job demands besides being constantly under political and media scrutiny, many of those demands cannot be met adequately. There are many professional and legal strictures that circumscribe the policing response, which can lead to frustration and this overload with job demands causes strain and stress in individual police officers. In a survey of stress in police personnel, Mathur et al. noted that job stress among Indian police remains a neglected area of research in India. Therefore, there is great need to explore this area for the wellbeing of police personnel. Psychological, physical, and work-related stressors have been shown to have negative effect not only on mental and physical wellbeing of an individual but also show negative effect on one's occupational duties. In India only limited attention has been paid to the investigation of stress for public. Mumbai police personnel are under constant stress due to one or the other reason. Mumbai police also started some remedial measures of yoga art of living and stress-busting workshop. All these are nothing but band aids employed to cover the huge bleeding wound that is the moral today's policemen. So to look the sources of job stress in Mumbai police personnel is the aim of the study. Aims and objective: To study the level of occupational stress in Mumbai policemen and its association with some sociodemographic factors. Mumbai for administrative purpose has been divided into three parts, namely, city, eastern suburb, and western suburb, which has been further divided into 12 zones. Each zone further divided into three to four divisions and each division has two to three police stations in it. To adequately represent samples from each part we applied multiage sampling. In each part we randomly selected one division and at divisional level we randomly selected one police station. After finalizing police station we included 20% of them in our study as per systematic random sampling so total 276 policemen (Class II and III) were included out of 1406. Prior permission from commissioner of Mumbai as well as informed consent from study participants was taken. The scale devised by Cooper et al. measures all the factors present in the work environment responsible for stress and use workers as the source of information by using questionnaire and interview technique and hence has been selected for the study. The questionnaire used is based on World Health Organization guidelines; Occupational stress index (OSI) Questionnaire  used in the present study consists of 46 items with five alternative responses. The items relate the relative components of job, which results in stress such as role over load, role ambiguity, role conflict, unreasonable group, political pressure, powerless, poor peer relationship, intrinsic improvement, low status, strenuous working condition, and unprofitability. A pilot study was done to strengthen the questionnaire on 45 policemen. After this we administered this questionnaire  to all the study participants (policemen Class II and III) at a time convenient to them in police station. The questionnaire comprises of Part I: Socio- demographic information and Part II: Occupational stress index scale (46 items) and each item was given a score as per the type of answer [Table 1]. The present epidemiologic study focuses on sociodemographic profile of Mumbai police with special references to their job-related stress. 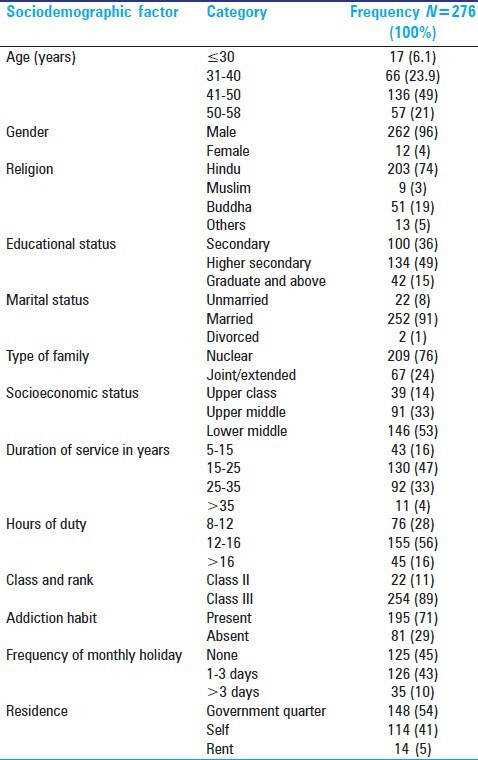 Maximum policemen, that is, 136 (49%) were in the age group 40-50 years in our study. This was more compared with studies done by Channbasvanna et al. and Rajput et al. who reported 28% and 39% in same category, respectively [Table 2]. Ninety-one percent of policemen were married in our study this was similar to studies reported by Kores et al. (81%). In the present study, 36.2% respondents were educated up to secondary. A 48.6% were educated up to higher secondary and 15.2% graduation and above. Channbasvanna et al. reported that 52.4% studied up to secondary, 22% higher secondary, and 20% were graduates. Almost 76% of the respondents have nuclear family, whereas in a study done by Channbasvanna et al.,  60% belonged to nuclear family. Fifty-three percent of policemen were from lower middle class family as per Kuppuswamy classification and other studies also suggested similar findings. A majority, that is, 130 (47%) policemen were in service for 25-25 years; and similar findings were noted by Channbasvanna et al.,  who found 20% belonging to the same service experience. Most of the respondents (44%) worked for more than 12 h a day, whereas Class II. Forty-one percent of Class III respondents worked for more than 16 h. Channbasvanna et al.,  and Davies  found higher percentage (80% and 63%) of respondents working more than 16 h a day. Almost 71% of respondents were addicted to either smoking or alcohol . It was observed that a majority 202 (73%) of police personnel had moderate level stress, whereas 50 (18%) of police personnel had high level of stress. High OSI was found among 25 (44%) in the age group 50-58 years. This association of OSI and age found to be statistically significant. This can be because as age advances, the responsibilities for work also increase. There was significant association of OSI and duration of service years, Ramanchandran et al. (1997) also noted a similar finding [Table 3]. Out of total 195 respondents who were addicted to one or other form of substance, 23% had high OSI. This association of OSI and addiction habit was found to be statistically significant. A similar study done by Pestonji (1992) and Agarwal  who found addiction in terms of coping behavior of smoking as a symptom of stress found to be high among constables (47%) followed by head constables (39%). The association of OSI and number of monthly holidays was found to be statistically significant. Sindhu (2000)  in his experimental study found higher satisfaction in the group who received weekly off. In high OSI role ambiguity (73%), under participation (49%), role overload (42%), strenuous working condition (34%), and unprofitability (28%) were predominant scales. A similar study conducted by Kores et al. in the United States identified administration, job overload, court related matters, role conflict, role ambiguity, unusual work hours, and line of duty crisis situation as the stress causing factors in police personnel. It was an observational study done on Mumbai police personnel with the aim of exploring few triggers associated with occupational stress in them. Total 276 police personnel (Class II and Class III) were screened for the OSI and we found that 73% were moderately stressed, whereas 18% were highly stressed. 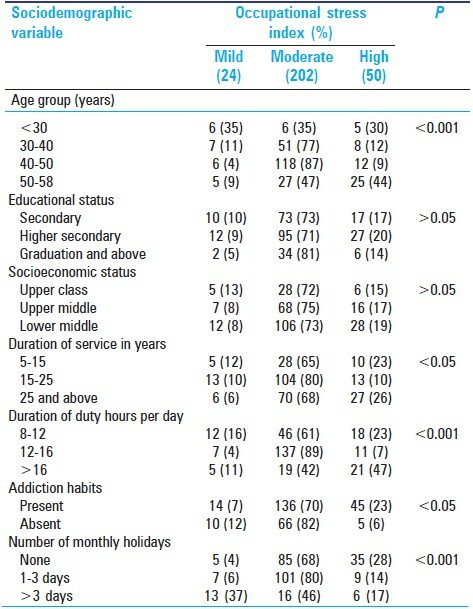 We studied the sociodemographic factors that are highly associated with it: Age group (50-58 years), duration of service in years (>25 years), duration of duty hours (>16 h/day), addiction habits, and number of monthly holidays (no holidays). At individual level: Person should develop hobbies as well as organization skills to reduce stress. Regular exercise as well as relaxing techniques such as yoga significantly reduce stress. Most important is right attitude toward job should be developed. Indian Police service. Available from: http://www.en.wikipedia.org/wiki/Indian_police_service [Last updated on 2014 Aug 9]. Encyclopedia of Occupational Health and Safety. 2 nd ed, Vol. 1 and 2. Geneva:ILO; 1971. p. 175-93, 23-41. Mathur KM. Indian Police after 50 years of Independence - A Reappraisal. Indian Police Journal 1998;45:68-72.
Cooper CL, Siu OI. The use of the occupational stress indiacator (OSI) in factory workers in china. Int J Stress Manag 1997;4:171-82. Samuel H, Osi P. Occupational Stress Inventory revised edition (OSI-RTM). North Florida: Psychological Assessment Resources Inc; 1998. Srivastava AK, Singh AP. Construction and standardization of occupational stress Idex, A Pilot study. Indian J Clin Psychol 1981;24:133-6. Rajput SS. Stress and mental health among the police professional in Baroda city, thesis submitted for MA in social work. Mumbai, Tata Institute of Social Sciences (TISS): TISS; 1988. p. 47-78. Davies C. A study of the experience of stress by police personnel and its implication on their families. Thesis submitted for MA in social work. Mumbai, Tata Institute of Social Sciences (TISS): TISS; 2001. Ramanchandran K. Job satisfaction, Job involvement, Job commitment in Mumbai city police. Thesis submitted for PhD in social science. Mumbai, Tata Institute of Social Sciences (TISS): TISS; 1999;2:p. 149-51. Pestonji DM, Agarwal SP. Second handbook of psychological and social instrument, New Delhi: Concept Publishing Company; 1988. p. 134-43. Sidhu HS. Reforms initiatives in police at district level. Indian Police J 2000;Vol XLVII:80-5. Krores WM, Margolis B, Hurrell JJ. Job stress in policemen. J Police Sci Adm 1974;2:145-55.